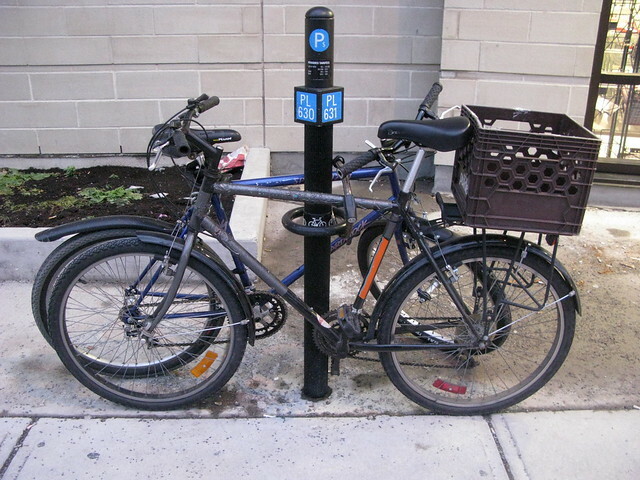 If there are North American records for number of bike parking spots, Montreal seems to be keen on winning. Every few metres or so on avenue du Parc there were these posts with a ring for attaching a bike lock. My friend Taras, whom I was visiting, explained that the number on the post corresponds to the parking spot on the street. Park your car, check the number, punch it into the parking ticket machine and pay. 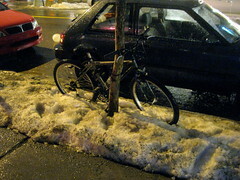 As an added bonus, bicycles can park there. Seriously... every few metres! What a brilliant idea. Apparently businesses can opt out of having the bike rack ring on the post in front of their shops, and a thick plastic condom is placed on the post to prevent most U-locks from being attached - although a chain wouldn't be a problem. These opt-outs were few, though. I saw loads of bicycles on the streets in the four days I was there, which was brilliant. I wasn't taking loads of photos and just enjoying the company of my friends instead, but bicycles abound. 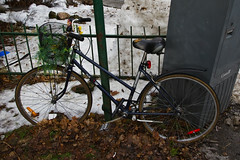 What really thrilled me was seeing so many bicycles parked in the neighbourhoods I visited. Outside flats, in bike racks on main streets, you name it. Most of them were untouched since the start of winter. Their wheels were still buried in snow. But why is that brilliant? It is one of the surest signs that a city is doing the right thing. 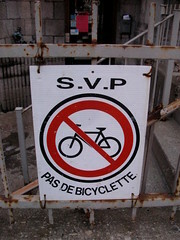 The citizens may find rusty chains and other bits in the spring, but Montreal seems to have crossed that magical line between bicycle fetishism and demystifying the bicycle. If you see bikes left out like that it means that the citizens regard the bicycle as a vacuum cleaner. A tool. And THAT is a step in the right direction towards re-establishing the bicycle on the urban landscape. And here's a rather polite sign, which is always nice to see. 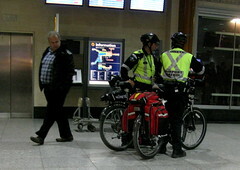 Just before disappearing through security I spotted these two bicycle security guards at Trudeau Airport. Dressed for Armaggedon but guite cool that an airport has two-wheeled security. I'm hoping to return in June to see the city blooming with bicycles.